Imagine being surrounded by people who WANT you to succeed. People that will support your goals, offer strategies, share new perspectives, AND hold you accountable! This is a Mastermind group. What progress will you make in your first month in our Mastermind? Mastermind groups have been around forever! At 21, Benjamin Franklin created a Mastermind group, which he called a “Junto.” It was a diverse group that included printers, a cabinetmaker, a clerk, and a bartender! The Junto led not only to the personal development of each member but also to innovations like, a public hospital and the first public library. The Mastermind group requires, confidentiality, willingness to both give and receive advice and ideas, and a commitment to support each other with total honesty, respect and compassion. Each group member is empowered to speak from experience, as well as from the heart. We realize that as busy people, we don’t always take the time to celebrate the small victories that can lead to big gains over our challenges so… Acknowledgements and celebrations of achievements, are mandatory! Advice is appreciated and criticism is always above all, constructive. 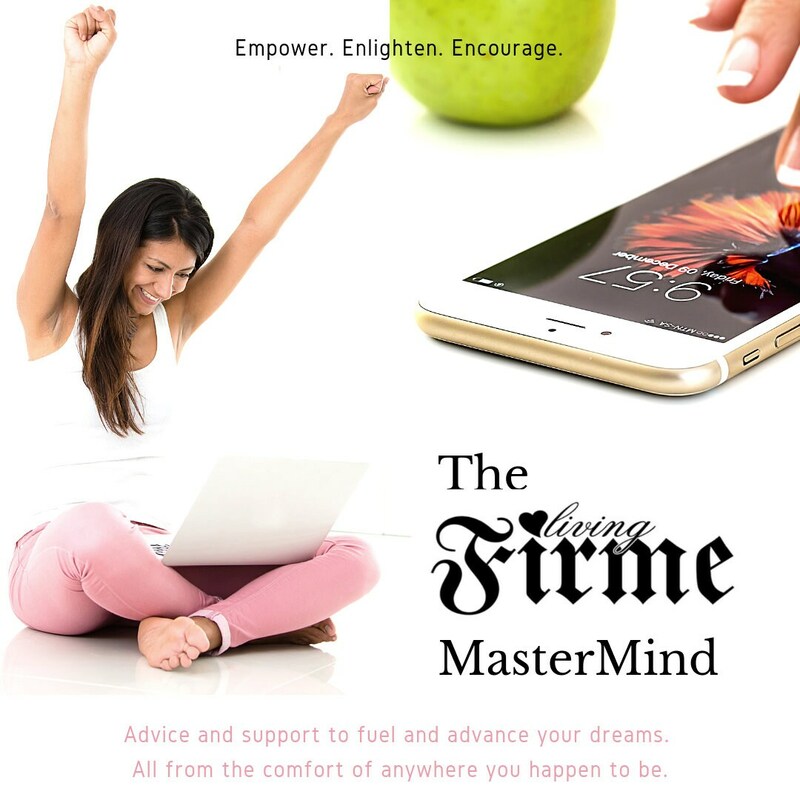 As the facilitator, Living Firme is tasked with making sure that conversations are deep and balanced, and that all mastermind group meeting agenda items are covered in the time allotted. We meet for 1 hour each week and there are no more than 8 members plus a Living Firme facilitator. This program is a direct result of our own personal mastermind group. If you qualify, you too could be talking through your goals with people that are making it happen for their lives, their businesses and their communities, every week. Once you purchase, we will send you a questionnaire. We reserve the right to refund the Mastermind purchase of we feel that we will not be a good fit. This group is a business focused group, designed to help you meet your life goals as they apply to business. This is a group ideal for the small business owner and will include sales and marketing strategies, business and networking resources, and of course the building of success mindsets. WHO SHOULD JOIN THE GROUP? You already have a successful business and don’t need to increase your income or your business. You don’t want to commit the time and energy to achieve greater goals. You can’t give support nor want to receive support from others in the group. You can’t commit to attending the meetings. You work better by yourself. You have a group of people who give you support. The meeting starts with everyone in the group sharing a success they had from the last meeting. Then, there may be a short education segment to discuss a topic or a chapter from a book. We then have the “Hot Seats” portion of the meeting which takes the bulk of the time. We end with everyone setting a goal to accomplish before the next meeting. WHAT IS A “HOT SEAT”? DO I HAVE TO PARTICIPATE IN THE “HOT SEAT”? WHAT DO WE TALK ABOUT IN THE MEETING? Every mastermind group has a theme. The Business Start-up Mastermind Group is for people who are just starting a business or have recently started one. The topics usually deal with getting a business started, marketing, advertising, pricing products and services, managing, legal matters, funding and finding assistants. We talk about whatever issues members are struggling with and want to discuss. The group works to brainstorm a solution. The personal Development group focuses on relationships, self care, mental, spiritual and physical wellness, getting your groove back and learning how to feel great in your own skin. WHERE DO YOUR GROUPS MEET? HOW OFTEN AND FOR HOW LONG DO YOU MEET? WHAT COMMITMENT DO YOU EXPECT FROM ME? You will lose the meeting but you will not lose your spot in the group. WHO IS IN THE GROUP? WHO IS THE IDEAL MEMBER? Our first track is a BUSINESS focused group meeting. “Small Biz Saturday” meets at 7:30am and new members are invited in every first Saturday of the month. This group is a business focused group designed to help you meet your life goals as they apply to business. HOW WILL I MEASURE MY PROGRESS WITH THE GROUP? In our first meeting, every member sets their long term and 30 day goals. At each meeting, you tell the group what you’ve accomplished since the last meeting, where you’re stuck, and what’s your next action/goal for the next meeting. You will receive an email with the suggested group guidelines, proposed agenda for our meetings and a goal-setting worksheet. There will be an introductory meeting. In this Kickstart meeting, we get to know each other, discuss the guidelines, agenda and set goals. Before each of the six meetings, you’ll get an email with the meeting video conference access. How Much Is This and How Do I Get Started? If you do your research, you'll find that groups like this filled with Fortune 1000 CEO's can run upwards of $100,000 a year! What?!!! Yep. We know that as small business owners, new artists and entrepreneurs, those numbers are crazy, but we wanted to show you that big companies understand what a Mastermind investment can do for their business. If you've got ideas that helped you to make feria, reduce your stress, and have a more balanced life, what would that be worth to you? The big companies are continually investing heavily in boards and in the development of their top level executives. Are you and your business losing money because you aren't investing in the right things? Is your family, relationship, or health suffering because you are too stubborn to reach out and let others help you? Let us help! Our groups are only $99/mo, an amount that should easily be one of the best investments you'll ever make in yourself and your business. Space is limited, so if you're interested don't wait!